In 1968, the world experienced a brand-new kind of terror with the debut of George A. Romero’s landmark movie Night of the Living Dead. The newly dead rose to attack the living. Not as vampires or werewolves. This was something new . . . and terrifying. Since then, zombies have invaded every aspect of popular culture. But it all started on that dreadful night in a remote farmhouse. . . . Nights of the Living Dead returns to that night, to the outbreak, to where it all began. 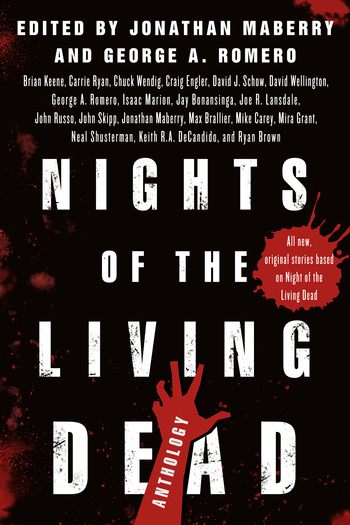 New York Times bestselling author Jonathan Maberry teams with the godfather of the living dead himself, George A. Romero, to present a collection of all-new tales set during the forty-eight hours of that legendary outbreak. Nights of the Living Dead includes stories by some of today’s most important writers: Brian Keene, Carrie Ryan, Chuck Wendig, Craig E. Engler, David J. Schow, David Wellington, Isaac Marion, Jay Bonansinga, Joe R. Lansdale, John A. Russo, John Skipp, Keith R.A. DeCandido, Max Brallier, Mike Carey, Mira Grant, Neal and Brenda Shusterman, and Ryan Brown. Plus original stories by Romero and Maberry! Fifty years ago I was able to convince several friends of mine that we might be able to make a movie … a real, honest-to-god motion picture, feature length. “Some projects made on a shoestring budget become classics, and Night of the Living Dead is one of those.” –Charlaine Harris, #1 New York Times bestselling author of the Sookie Stackhouse novels which became HBO’s hit True Blood. “With Night of the Living Dead, George A. Romero created a mythology that is both a lens through which to view the fissures at civilization's core, and a mirror whose reflection offers an unflinching view into man’s very soul. Ignore the skeptics; the 'Zombie Apocalypse' paradigm will never be irrelevant." –Axel Alonso, Editor-in-Chief of Marvel Comics. “Night Of The Living Dead didn’t just invent the zombie genre as we know it; it also established that genre’s most significant theme: that we, humanity, are more dangerous than the undead.” –Christos Gage, New York Times bestselling writer of comics (Buffy, Spider-Man), television (Daredevil, Law & Order: SVU), film and video games. JONATHAN MABERRY is a New York Times bestselling author, five-time Bram Stoker Award winner, anthology editor, and comic book writer. He writes for adults and teens. He also writes comics for Marvel, IDW, and Dark Horse. He lives in Del Mar, California, with his wife, Sara Jo, and their dog, Rosie. GEORGE A. ROMERO (1940-2017) is an iconic filmmaker and editor. His most famous accomplishment is the creation of what we now know as “zombies” via his films Night of the Living Dead and Day of the Dead.